here is the gathered panel skirt. make the main rectangular body of the skirt. mind looking a bit um... hot-air-balloonish. I'm just sayin'. even know who the Big Names are in fabric design. find her fabric, so I end up hacking into her tablelinen. said such nice, kind things about. But textured fabric! Now that I have a weakness for. one is another ikat! Love ikat. fabric, and it is printed. OK, enough rambling about fabric. As with the earlier two skirts, measure the waist of the wearer and call it A. Decide on the length of the skirt you want and call it H.
-Height H+ 2 " seam allowance. So for Emily's 21.5" waist, her 12" long skirt would be from a final rectangle 44" x 14". Decide how many panels you want. I am often constrained by the dimensions of my scraps. But maybe you will make your skirt from a lovely, new, huge piece of fabric. 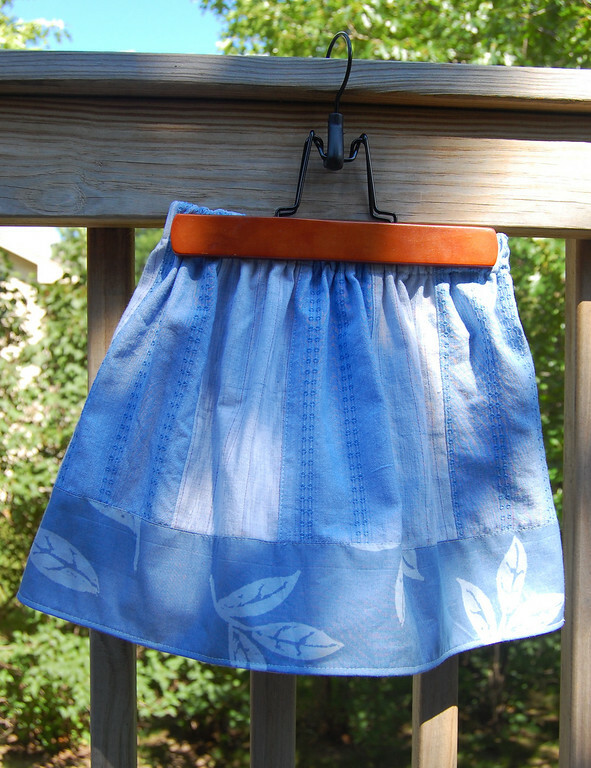 For this blue skirt, I used 10 panels. If you are alternating two fabrics for the panels, pick an even number of panels. Divide 2A by the number of panels to give you the width of each panel. Add 1" seam allowance to that to give you the width of panel to cut. With Emily's skirt, each panel was then about 5.5" x 14". Cut the 10 panels out of the fabric(s). Zigzag the raw edges. 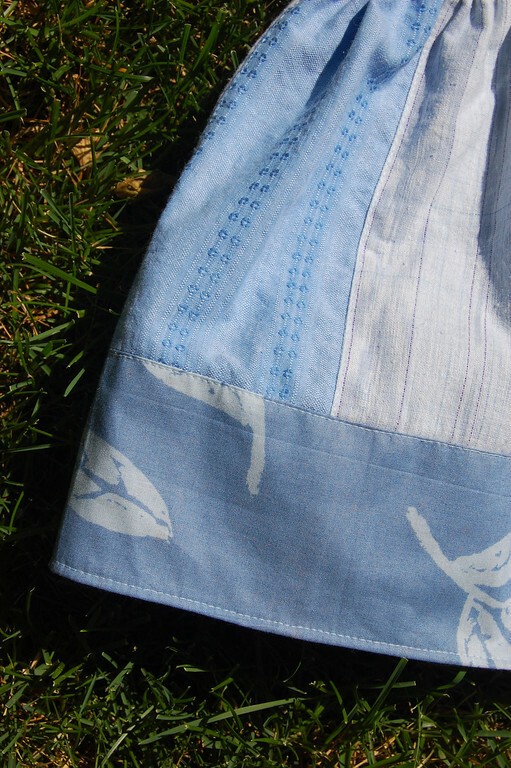 With a serger, this can be done in one step. Join all 10 panels to make a large rectangle (like the one in the second picture). 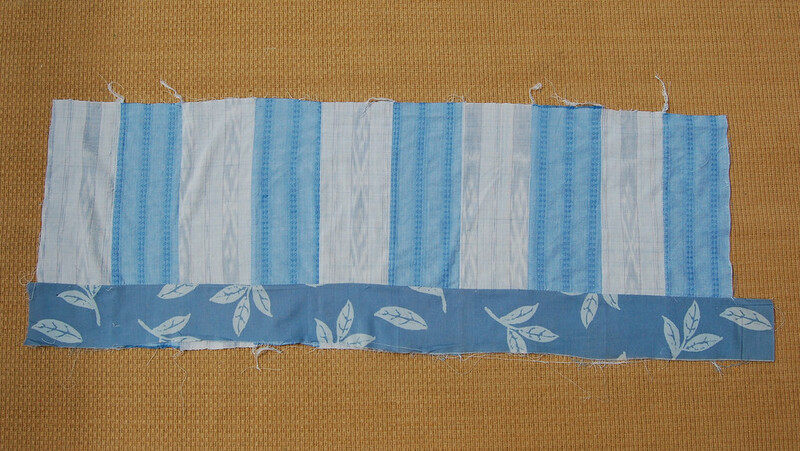 Add other details, like a horizontal band of a different fabric, if you like. 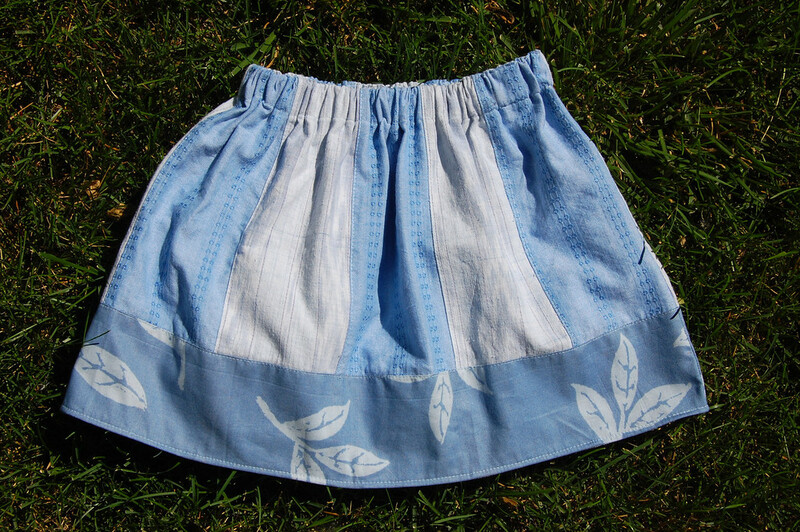 Sew up the rectangle as you would the classic gathered skirt, add elastic, and hem. enough scraps, I'd make one for me! And thus ends the Gathered Skirts Trilogy. I don't know if it's just me hon, but haven't been able to see any of your pix in your skirt posts!!! Just thought I'd best let you know, incase it's not just me!!! Loving the skirt tutorials. I have a pile of thrifted fabric that I've set aside to make skirts for Eleanor out of. I must carve out some time soon.